Snowmania is a 5 reel, 20 payline Christmas themed slot powered by RTG. 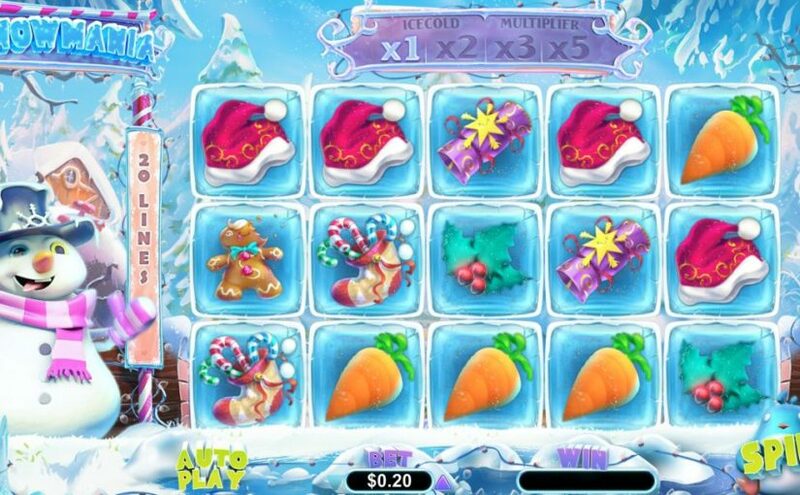 The Snowmania Slot will have you in the Christmas spirit instantly after your very first spin as you embark on a journey through a winter wonderland in search of your very own Christmas miracle. Snowmania is set on a scenic winter backdrop, offering 5 icy reels with a Christmas symbol frozen inside each cube. Winning symbols are immediately “crushed” after wins are paid. New symbols appear giving extra chances for more wins. Thanks to the Morph Magic feature, prizes increase with each win — x2 after the first crush, x3 after the next and x5 after that. . Three or more Christmas Present symbols triggers 10 free games. All free spin wins give up to 15X payout.